In the early 1900s the west end of Berwick was home to more than 100 Ukrainian and Ruthenian families. Prompted by prolonged political unrest in their native country, they immigrated to America, the land of freedom. Those that settled in Berwick were young, ambitious, and full of high hopes for their new life. Many found employment at the American Car and Foundry Company. Being the only large industry in the borough at the time and the center of Berwick's economy, the company produced passenger and freight cars for many railroad systems throughout the country. Having become a skilled and indispensible part of the community, these morally strong men and women still faced one dilemma, there was no church in town where they could worship according to their traditions. The only catholic church in town held services according to the tradition of the Latin Church, the Ukrainians were used to celebrating their feast days according to the Julian calendar and to praying and attending Liturgy in Old Slavonic according to the ritual tradition of the Eastern Church. Although the hard earned wages of these Berwick residents were modest, there was only one solution; they would build a House of Worship to call their own. As the planning began for the new building, the Trustees of the Calvary Methodist Church offered their church, located on the corner of Warren Street and First Avenue, for sale. Since many of the Ukrainian families already lived around that church, it only made sense to purchase the property. On February 15, 1908, George Ragan, Frank Timko, and Andrew Savruck, Trustees of the Ukrainian Congregation signed for the transfer of the property for a consideration of $5,600. In the following months the congregation began readying and remodeling the former Protestant church for liturgical use according to the customs of the Ukrainian Church. Their love and respect for God and their new church was truly exhibited when they had the entire structure turned on its foundation so that the main altar would face east. According to the Eastern Rite, if possible the main altar should face east becuase Jesus the Son of God was born in the East; until now the main altar had been facing north. A very important next step for the young congregation was selecting the patron saint of their newly acquired church. After much discussion, the decision was reached that their church would be named in honor of the saintly brothers Cyril and Methodius, two great 9th century missionaries of several Slavonic nations who are credited with translating the Bible and Divine Liturgy into Old Slavonic. Regular Sunday Divine Liturgies started in September of 1909 with Reverend Father Ilarion Yakymowych, the parish's first resident pastor. As of a result of the Berwick people's poor financial situation, it was difficult to raise sufficient funds for the proper support of the priest. 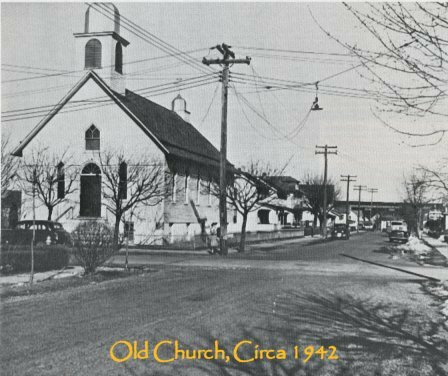 Despite their financial hardships, on October 7th, 1915 they purchased an additional empty lot adjoining two other lots on which was originally built Calvary Methodist Church. They also purchased a home across the street from the church as a temporary rectory for their priest. Then, in 1916 under Reverand Father Joseph Bernatsky, the congregation built a new spacious rectory. Among the many struggles faced by the congregation was attracting priests to serve their church for any length of time. Between the years of 1909 and 1933 no priest served for more than two years and their were times (in 1911, 1912, 1916, 1920, and 1923) that the pastors were changing twice during one year. There were several reasons for this, one being that nearly all the priests serving the small parish were young and desired a greater field for their missionary work. Another reason being a lack of understanding between the church committee and the priests. Regardless of the many changes in clergy, church life continued to grow and develop with the purchase of lots on Dickson Street for a cemetery and acreage for a parish park situated on the southerly bank of Little Briar Creek and the north side of Fifth Avenue. For almost ten years all social and religious life was limited to the church, that changed on November 30th, 1942 with the purchase of the former Columbia Brewing Company, consisting of eight apartment units and a social hall. Due to the poor condition of the building, the whole property was purchased for less than $10,000. Characteristic of our parishoners, many donated their free time and efforts to bringing the property back to life. The property later served as the site of Ss. Cyril & Methodius parochial school, established in 1945 and holding its last graduation in 1968. Despite the positive happenings in the young parish's life, there were times of conflict and financial uncertainty. In 1947 disagreements arose between the congregation and the pastor regarding church finances and debt. The parishoners felt they should have a voice in deciding about the disbursement of church funds and the overall administration of the church. Eventually, legal action was brought against the church committee by the pastor with the judge finally deciding that since Ss. Cyril & Methodius Church in Berwick was part of the Catholic Church in America, all final decisions belonged to the bishop of the diocese and his priests. Of course, this legal decision did not resolve the conflict and many parishoners were beginning to fall away from the church. Under these conditions and the diminishing financial contributions, the parish could not afford bank payments and the payment of taxes on the property. During this time of adversity, a new pastor, Reverend Father John Bilanych was assigned to the Parish in 1948. Accordingly, a number of parishioners began returning to Ss. Cyril & Methodius. With things looking up, the brick veneering of the old wooden church, delayed due to the shortage of funds, resumed in the spring of 1949. By the end of November, not only was the veneering finished, but a new set of brick steps also had been built. With a new pastor and the restored hope and enthusiasm of the people, all debts and bank loans from the old church were paid off by the end of 1955. On June 10, 1956, the accomplishment was marked by a mortgage burning banquet in the church hall on Freas Avenue. By the year 1960 the congregation was beginning to outgrow their small church. To remedy the situation, the pastor and the parishioners excitedly began plans for the construction of a new church. It was decided that each family would contribute $300.00 towards the project. As always, the response of the faithful was selfless and sincere. Not only did the individual families donate generously but also the church societies, including the ladies of the parish who donated all proceeds from the weekly perohi sales. On Wednesday July 6, 1966, ground breaking ceremonies for the new church took place at 5:30 pm in the presence of several priests, parishioners, and friends. On the memorable day of November 26, 1967, the cornerstone of the Church was blessed at 2:30 pm and the doorposts, trusses, and altar were annointed with holy oil. The blessing was given by Metropolitan Archbishop Ambrose Senshyn. Forty one years after the construction of the new church, under the leadership of Father John Seniw, Ss. 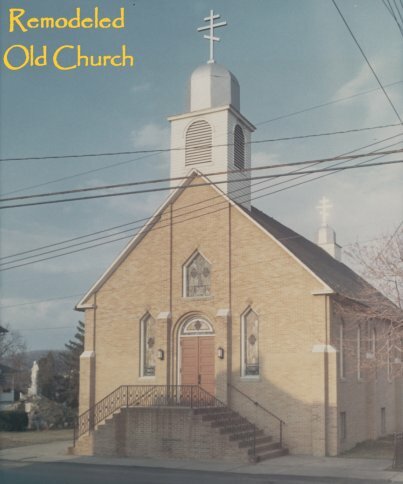 Cyril & Methodius Ukrainian Catholic Church in Berwick, PA is preparing to celebrate its 100th anniversary. Physical preparations for our centennial celebration include the painting of the church domes which was completed in September 2007, as well as gold leafing of the windows and new carpet which was installed during the summer of 2008. Spiritual preparations for this celebration of Faith will begin in the year 2008. As this special occasion approaches, our prayer is that our parish continues to grow, strengthen, and see many more blessed and prosperous years. Mnohaya Lita!